Every now and then I introduce the English-only readers of this blog to notable developments in human origins research taking place among Russian academics. I previously aspects of Yuri Berezkin‘s comparative mythology project, Vladimir Napol’skikh‘s peculiar linguistic opinions and surprising folkloric conclusions, and criticized one recent interdisciplinary effort by a team of Russian academics. It’s now time to look at the work of physical anthropologist Alexander Kozintsev and especially his recent hypothesis of “Boreal” metarace. Alexander Kozintsev, my former professor of physical anthropology at St. Petersburg University, is a remarkable man by many counts. The son of a famous Soviet cinema director, Grigory Kozintsev, and the grandson of Moses Kozintsov, a medical doctor and science writer of rabbinic extraction, Alexander Kozintsev, by virtue of his descent, is a powerful mix of intellectual rigor, profound curiosity reaching into the very depths of human and primate origins, and artistic creativity. Well-read in current Western physical anthropological and evolutionary studies, he nevertheless retains epistemological “period details” harkening back the theoretical frameworks that were once dominating over the Soviet academic landscape – from the race anthropology of Alexander Zubov and Nikolai Cheboksarov to the Marxist-Engelsian labor theory of the evolution of human culture to pre-post-modernist scientific essentialism (as evident in his scathing, biting, pinching and tickling – almost pre-sapient – Russian-language review of the pseudo-enlightened Homo Imperii tome by Marina Mogilner). Kozintsev’s own research spans an encyclopedic universe from a description of the skeletal inventory of Bronze Age Tagar culture to Indo-European homeland studies to innovative quantitative craniological methods to primate ethology to the evolutionary origins of laughter to glottogenesis. (Grigory Kozintsev’s silent cinema roots have undoubtedly contributed to Alexander Kozintsev’s belief in the gestural origin of human speech.) The recent origin of Amerindians from Siberian Mongoloids falls somewhere in this range of Kozintsev’s fields of interest. For instance, he is known to have discovered (also reported later here) “collateral relatives” of Amerindians among the skulls of Bronze Age South Siberia. Interestingly, the analysis of Bronze Age Okunev and Sopka-2 cranial specimens (see on the left) led Kozintsev to reject, back in 2003, the currently popular (thanks to the recently discovered Amerindian genetic profile of the 24,000-year-old South Siberian Mal’ta boy) idea of a West Eurasian (“Caucasoid”) admixture in Amerindians. 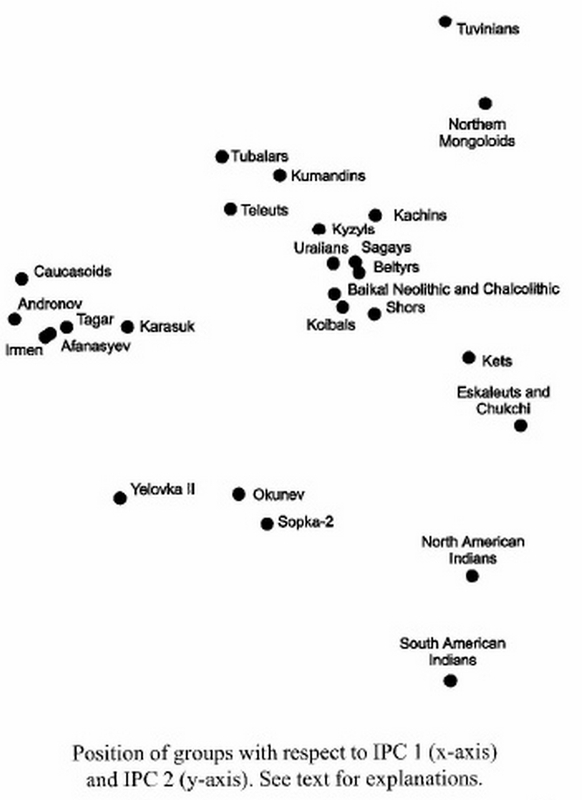 Instead, Kozintsev explained the Amerindian shift in the PCA plots based on a multivariate analysis of those skulls as the better preservation of an ancient Eurasian cranial profile (pre-Caucasoid and pre-Mongoloid) among modern Amerindians and its nearly-complete replacement in East Asia. 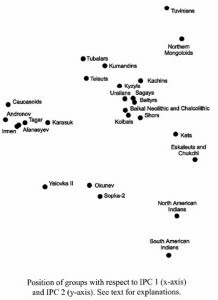 In a recent post on the mainstream Russian portal of human origins news entitled “Caucasoids, Mongoloids, Australoids: Evolutionary Stages or Genetic Admixture” and dedicated to the memory of both the Russian Zubov and the recently deceased Christy G. Turner, Kozintsev’s American friend of many years, Kozintsev develops this intriguing interpretation further. He starts off by revisiting the old division of human cranial types into two “metaraces” – Western and Eastern – advocated by Soviet physical anthropologists. 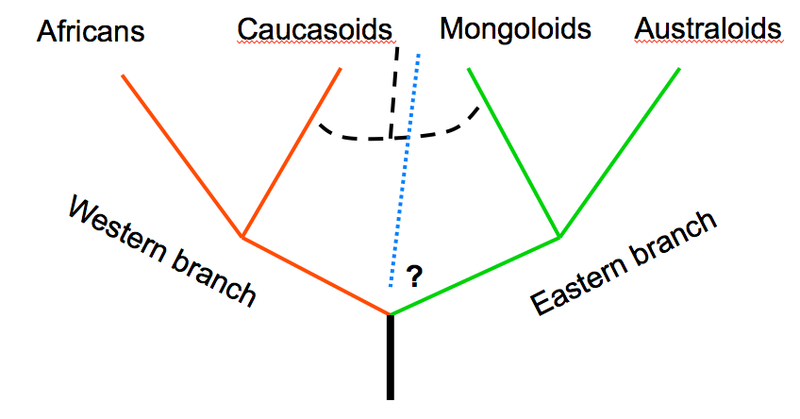 Zubov-Cheboksarov’s model classified Sub-Saharan Africans and Caucasoids as the “Western branch” and Australoids and Mongoloids as the “Eastern branch,” while Valery Alexeev’s model classified Sub-Saharan Africans, Caucasoids and Australoids as the “Western branch” and Mongoloids as the “Eastern branch” (see below, graphs recreated from Kozintsev’s Powerpoint presentation). 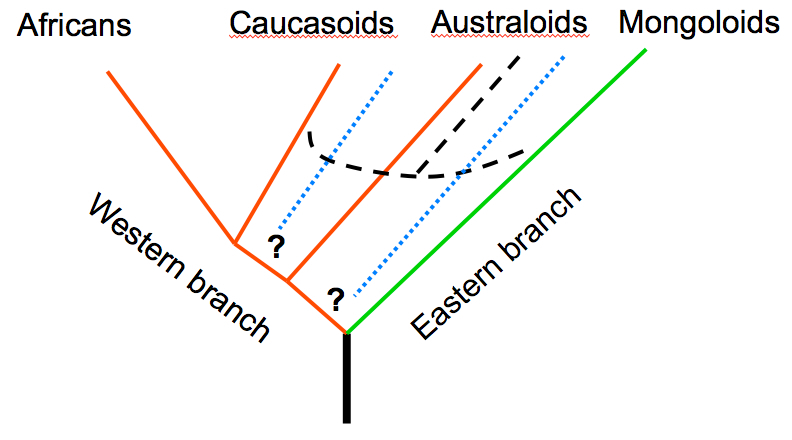 As the two graphs demonstrate, Zubov, Cheboksarov and Alexeev were ambiguous regarding the geographic origin of the Western and Eastern branches of humanity. They both appear equidistant from the hypothetical root of the human tree. Kozintsev claims that the Western-Eastern model has been disproved by recent whole-genome studies of ancient and living modern humans. Now that he declared it “dead,” he proposes to regard Sub-Saharan Africans and Australoids as “living ancestors” (and not sister clades) of Caucasoids and Mongoloids. The latter form a derived “metarace” that he calls Northern, or “Boreal” (pace Biasutti R. Le razze e i popoli della terra. T. 1. Torino, 1941, 275). The Boreal metarace diversified into the Caucasoid and Mongoloid subbranches in the course of the colonization of Eurasia during the second wave of migration out of Africa. While the answer that Kozintsev gives to the enigma of human origins and dispersals is crystal clear, a whole host of questions arise regarding the factual basis for his argument. His reading of Western articles has led him to believe that whole-genome studies “proved” (and here we have Kozintsev the Essentialist talking) that the Sahul was peopled from Africa first and that the founding migration went via the Arabian Peninsula along the coast of the Indian Ocean. In reality, the coastal migration hypothesis was advanced prior to whole-genome and ancient DNA studies as an attempt to theoretically circumvent the practical problem of the lack of Neandertal mtDNAs in the modern human maternal gene pool as contrasted with archaeological and paleobiological evidence for the presence of Neandertals in inland West Asia along the purported route of an out-of-Africa migration and the replacement of “anatomically modern humans” by Neandertals in the Levant. What the whole-genome and ancient DNA studies did bring to light are, first, that all non-Africans possess Neandertal genes (hence a coastal migration out of Africa is a moot point); second, that Papuans and Australians have an excess of Denisovan genes on top of the common non-African Neandertal heritage and Denisovans are attested in South Siberia (and not along the coast of the Indian Ocean); third, that Neandertal admixture is found at very small frequencies across Sub-Saharan Africa. So, the very distribution of the so-called “archaic admixture” among modern human populations militates against Kozintsev’s Boreal model. When the original coastal migration theory was formulated, scholars used Andaman islanders as a population that was presumably left behind in the course of the early modern human beachcombers’ journey to the Sahul. But recent genetic analyses refuted the idea that Andamanese are a relic of a coastal migration out of Africa that supposedly took place between 100,000 and 50,000 years ago. Kozintsev makes no mention of this development. In the title of his post, Kozintsev invokes “evolutionary stages” and “admixture” without realizing that both concepts confound the phylogenetic thinking that underlies the out-of-Africa theory and create a phylogenetic paradox. Kozintsev has a special knack for the metaphor of a “living ancestor” (Ainu are the “living ancestors” of Mongoloids, Sub-Saharan Africans and Australian aborigines are “living ancestors” of other modern humans, etc. ), which is not something that Western population genetics or physical anthropology dealing with human origins operate with because of their commitment to the governing premise of neutral, clockwork evolution. He prudently contrasts “living ancestors” with “admixed populations” and cautions against the danger of conflating the two. 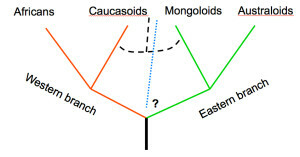 For instance, he mentions the odontological studies by Matsumura and Hudson that disprove Christy Turner’s “Sundadonty” taxon by showing that Southeast Asian dentition is not ancestral to Sinodonty (and the rest of human dental types, as Turner wanted it to be) but is in fact an artifact of regional Holocene admixture between Sinodonty and “dental Australoids” (The same argument was earlier put forth by Alexeev in his book Географические очаги формирования человеческих рас. М., 1985, 158.) He is willing to extend the same counterargument to a number of genetic studies that purport to demonstrate special cladistic affinity between Australoids and Mongoloids. But when it comes to Sub-Saharan Africans he assumes a) that they are pure and unadmixed, despite the whole-genome and paleobiological studies that demonstrate the opposite, but also b) that they are “living ancestors” of other modern humans despite all of the genetic evidence that suggests that Africans are more heterozygous than non-Africans. The notion of a “living ancestor” requires that the evolutionary rate in those populations is slower than in “non-living ancestors” that consequently evolved faster away from a common prototype. But higher heterozygosity is known to be correlated with faster and not slower mutation rates, so the “living ancestor” moniker is not applicable to Sub-Saharan Africans. Finally, the fact that Sub-Saharan Africans are opposed to all of non-Africans, as Kozintsev quotes Lachance et al. “Evolutionary History and Adaptation from High-Coverage Whole-Genome Sequences of Diverse African Hunter-Gatherers,” Cell 150 (2012), 457–469), may just mean that they admixed with African “archaic hominins” to a greater degree than non-Africans admixed with Eurasian “archaic hominins.” It’s not clear why Kozintsev mentions Matsumura and Hudson admixture argument against Turner’s out-of-Southeast Asia theory but does not consider an admixture explanation for the specificity of the African genetic makeup. So, Amerindians predate the formation of the “Boreal” branch. This is what MA-1 DNA indeed shows. But MA-1 does NOT furnish evidence for a “metarace” uniting “Caucasoids” and “Mongoloids.” In his crusade against the “Western-Eastern” model, Kozintsev doubts his own craniological data that once made him conclude that Ainu represent “living relics” surviving from the earliest stages of the development of the “Eastern branch” (and hence sometimes displaying vague “Australoid” traits, which now Kozintsev is obligated to discard). But Kozintsev severely underestimates ancient affinity between Amerindians and Australoids. 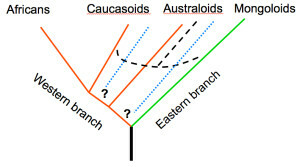 This affinity can be seen in their similarly fragmented population structure, high linguistic diversity and “elementary” kinship structures, the shared lack of typical alleles found in Eurasia and Africa (see below, left) coupled with stronger continuities with Eurasian hominins such as Neandertals and Denisovans as compared to Sub-Saharan Africans, Caucasoids and Mongoloids (see below, right), cranial affinities linking Paleoindian and Fuegian skulls with both Ainu and Australian aborigines and finally the mythological, musical and ethnographic parallels between Amazonia and North America, on the one hand, and Melanesia and Australia, on the other. 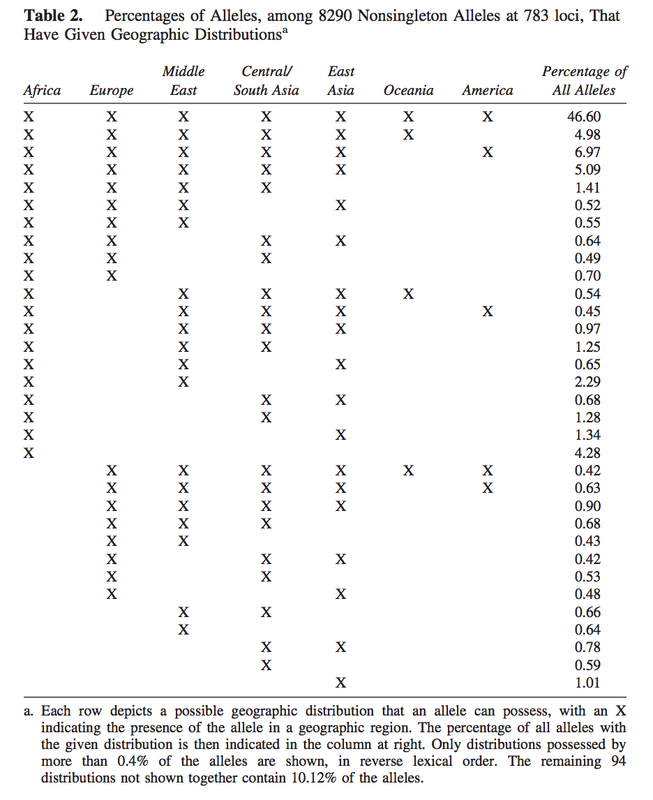 Amerindians and Sahulians share the fewest number of alleles with Eurasians and Africans (from Rosenberg, Noah A. “A Population-Genetic Perspective on the Similarities and Differences among Worldwide Human Populations.” Human Biology 83: 659-684). 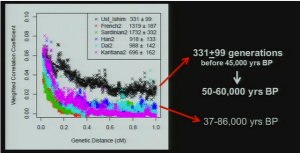 The rate of decay of Neandertal DNA chunks in Amerindians (Karitiana) as compared with West Eurasians, East Asians and the ancient Ust’-Ishim sample (from Svante Paabo’s talk). It’s possible therefore to salvage the “Western-Eastern model” by restricting the “Eastern” branch to the Circumpacific, “Easternmost,” as it were, populations such as Amerindians, Ainu and Australoids. 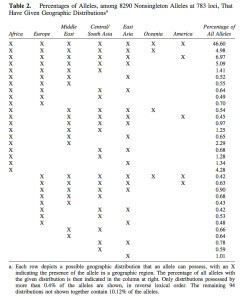 Westernmost Caucasoids and Sub-Saharan Africans are the least like Circumpacific populations when it comes to everything from population genetic structure to patterns of linguistic diversity, hence, contrary to Kozintsev and in the light of the available cross-disciplinary evidence, the Eastern-Western division of human genetic, linguistic and cultural diversity still holds true. German, if I understand the Western-Eastern Metarace Model 1 is only supported by craniometry using phenetic, not cladistic methods. 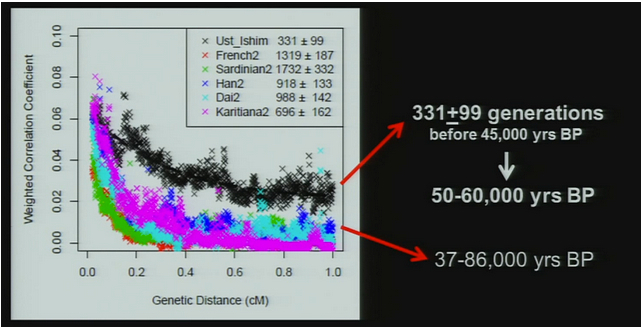 But is bizarrely supported by ADMIXTURE runs at K=2. The Sahel & Horn regions of Africa were confirmed by Tischkoff et al to have substantial back-to-Africa admixture corresponding to what typological texts used to call Aethiopid – people with Euro type facial features, wavy hair. Also the indigenous religions of these areas, like that of the Dogon, follow Witzel’s Laurasian structure. I would like you to blog on back-to-Africa to see what Russians think about pre-Arab, cross-Saharan migrations & interchanges.